The P.V.Narsimha Rao Telangana Veterinary University has issued a notification for PVNRTVU Recruitment 2018-2019. Therefore, we have provided the details related to the PVNRTVU Notification 2018-2019 on this page. Moreover, the total number of positions are 183 for the General Faculty Recruitment and B. Limited Faculty Recruitment. Furthermore, we have provided all the details regarding PVNRTVU Recruitment 2018-2019 in the below sections. And, we have also arranged the Educational Qualification and Pay Scale details. In addition to this, the application process has started and it will be closed on 09th April 2018. So, the candidates need to apply fastly for the PVNRTVU Notification 2018-2019. Furthermore, applicants can also find the Post Wise Vacancies at the bottom of this post. Moreover, we have also provided the Procedure To Apply For The PVNRTVU Recruitment 2018-2019. Moreover, the P.V.Narsimha Rao Telangana Veterinary University is ready to recruit the worthy and talented candidates for the vacancies. So, for the aspirants who are looking for the jobs in Telangana State, it is a good news. Therefore, applicants need to utilize the opportunity. Furthermore, competitors need to refer the whole article to get the details about the PVNRTVU Recruitment 2018-2019. And, we have gathered the more details in the below sections. Hence, aspirants need to refer the below sections to get the clarification related to the PVNRTVU Recruitment 2018-2019. In addition to this, the detailed vacancies are Professor: Veterinary Science, Associate Professor: Veterinary Science, Fishery Science and Assistant Professor: Veterinary Science, Dairy Science, Fishery Science, Agricultural Sciences, Library Science, Physical Education. For the Associate Professor: Veterinary Science, Fishery Science, Dairy Science and Assistant Professor: Veterinary Science, Dairy Science, Agricultural Sciences, Library Science. Applicants need to apply for the PVNRTVU Recruitment 2018-2019 in offline mode. Before applying the aspirants need to check all the qualification which are provided on this page. Therefore, we have gathered the qualification details in this article. Moreover, from the above table aspirants can find the official website of the P.V.Narsimha Rao Telangana Veterinary University. 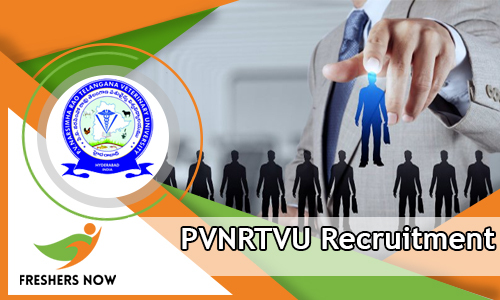 The notification for the PVNRTVU Recruitment 2018-2019 is released through its official website. In addition to this, we have provided the link to download the notification at the bottom of this post. The applicants who are ready to apply for the PVNRTVU Recruitment 2018-2019 need to check the educational qualification. Therefore, we have provided the qualification details in this section. Furthermore, the candidate needs to acquire their Ph.D. Degree or any other equivalent degree from recognized Board/University. So, the aspirants will satisfy the above-mentioned qualification can apply for the PVNRTVU Recruitment 2018-2019. After verifying all the details aspirants can apply for the PVNRTVU Recruitment 2018-2019 if they satisfy the given qualifications. Moreover, the organization will pay Rs. 15600/- Rs. 39100/- along with Grade pay Rs. 6000/- for the Assistant Professor and Rs. 37400/- Rs. 67000 along with Grade pay RS. 9000/- for the Associate Professor. Furthermore, all the details related to the pay scale are mentioned in the below sections. So, aspirants can check all the details on our site. In addition to this, there is no written test for the candidates. The interview is only the selection process for the aspirants. Moreover, the applicants need to between 21 years to 50 years to apply for the PVNRTVU Recruitment 2018-2019. So, it is important to check the age limit before starting the application process. Furthermore, aspirants need to concentrate on their preparation for the Interview process. And, applicants need to know the tips to crack the interview. In addition to this, there will be a competition for the Interview round. Hence, the applicants need to be careful while attending for the interview. In the below sections, aspirants can find all the particulars in detailed related to the PVNRTVU Recruitment 2018-2019. And, the candidates need to pay the registration fee while submitting the application form. So, the aspirants need to check the fee details in the below sections. Moreover, the applications which are submitted after the last date will be rejected. And, the applications which are against to the given qualifications will also be rejected. Furthermore, contenders need to check the particulars carefully before applying for the PVNRTVU Recruitment 2018-2019. Therefore, we have given all the detailed information on this page related to the PVNRTVU Recruitment 2018-2019 Notification. In addition to this, based on the category applicants need to pay the fee. Along with the form, submission applicants need to pay a fee which is mentioned in this sections. Therefore, aspirants need to check the fee details before applying for the PVNRTVU Recruitment 2018-2019. In this section, we have provided the step-wise procedure to apply for the PVNRTVU Recruitment 2018-2019. So, the applicants can check and follow the procedure. Hope, the given article on PVNRTVU Recruitment 2018-2019 is useful to all the applicants. For more clarification like Recruitment, Syllabus, Previous Papers, Admit Cards, Result, Answer key follow our web portal Freshers Now.